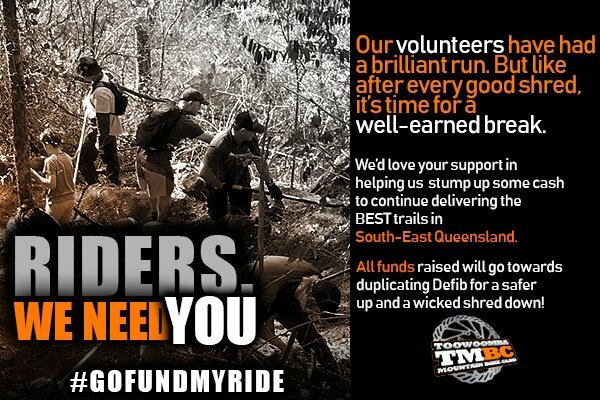 Toowoomba Mountain Bike Club is a volunteer community organisation raising funds to pay for the construction of a new trail. This trail will run parallel to the current Defibrillator trail and will allow Defibrillator to become a one way descending trail. The new trail will be a one way climbing trail. Future plans are also in the pipeline to beef up the existing Defibrillator trail to include more features as well as larger berms for an even faster descent. Trails in the mountain bike park usually rely on community grants or are hand built by volunteers. However, additional grants are unlikely to be successful anytime soon given we recently were awarded funds to build the new Topshelf trail and our volunteers need a break. Your donation will make riding in Jubillee safer from potential two-way collisions and a more enjoyable riding experience. The largest donor will be given the rights to naming the new trail. All other donors will be recognised on a sign at the start of the trail head like what was done on Anonymous. Thank you for your generous donation. So far $16,000 has been raised through our go fund me and another $2,000 was donated directly to the club from Burke Industries. The club also applied for a local community grant which has past the first round and should know in the coming weeks of the outcome. We will keep you updated on what is happening with the new trail. Thank you for your donation. Just to keep you in the loop we are sitting at $10,500 a bit under what we need. The club has decided to apply for a council grant, due later this week, who will match our funds in kind. Our goal is to try and raise $5,000 this week so we maximise the in kind support. We do not expect anymore from you but if you know someone thinking of donating please encourage them to do it this week. Thank you for your donation we are 1/4 of the way there to the new Defib climbing trail. We know you have done your part and if you know anyone else that can help please let them know about our campaign.